Most people who use a regular alarm clock have trouble waking up. Your body is usually partially asleep even after being waken up. Do you feel confused and disoriented when you wake up in the morning? That feeling is called sleep inertia. This condition could last anywhere between a few minutes to several hours. If it lasts long, it could affect the normal functioning of the body. Why Do I Wake Up Feeling Disoriented? Sleep inertia happens when you wake up suddenly during REM sleep. If you wake up during this stage of your sleep, you still have high levels of melatonin. This is a hormone released by the pineal gland in the brain, which controls your sleep and wake cycles. You will, therefore, still be very sleepy. The levels of melatonin are determined how long you’ve been asleep in the REM stage. If instead you wake up during non-REM stage, you will feel much more alert and awake. This is because your brain activity and heart rate have slowed down considerably. To understand this concept better, imagine sleep as being made up of 3 or 4 stages. If you wake up after having completed 3 full stages, you will feel much better than if you woke up midway through the 3rd stage. Your memory and decision-making ability is usually impaired immediately after awakening. Your performance can also be affected. It could be dangerous to drive or operate heavy machinery at this time. Researchers have even shown that the brain functions better when you stay up all night than during sleep inertia period. Abrupt awakening - Waking up suddenly increases the chances of feeling groggy. A normal awakening process will always reduce the effects of sleep inertia. However, confusion lasts only a few seconds if you wake up suddenly due to perceived danger. Less sleep - People deprived of sleep are more likely to experience longer and more severe periods of confusion. Time in the sleep cycle - The risk of extended periods of disorientation is higher if you wake up during sleep cycle 3 or 4 than if you wake up during cycle 1 or 2. Taking a nap - Sleep inertia can occur even after a short nap. Waking up disoriented will occur after a nap especially if you are sleep deprived. Although the disorientation lasts for a few minutes to half-hour, it could cause problems if you’re expected to perform immediately. Are you waking up disoriented? Adrenaline and caffeine are the most common remedies for sleep inertia. However, they only help you with the consequences and not the cause of the problem. Drinking a cup of coffee can keep you awake and improve concentration by stimulating the central nervous system and boosting your blood pressure and heart rate. Avoid napping late in the evening as this can affect the quality and length of night sleep. Adopt a regular sleeping and waking up schedule to keep yourself in sync with your personal circadian rhythms. A regular alarm clock has to go off when the time comes. It does not care the sleep stage you are in at the time. Sometimes, you still go back to sleep and thus risk oversleeping. This may be troublesome especially if you have to report to work in the morning. All is not lost since there are sleep stage alarm clocks in the market. Such alarm clocks are aware of your sleep patterns and will only wake you up during optimal stages of sleep. This will greatly help curb sleep inertia and improve how you feel in the morning. You can also opt for an app that measures the stage of sleep you are in. There are devices that come in form of headbands to measure brain activity. Bear in mind that while this sounds great, there are mixed user reports. Waking up disoriented? A daylight alarm lamp is the other available option. This lamp emits a light that mimics the light of the sun tricking your brain to believe that it is actually day time. It also has a gradual lightening effects as well as the sound of birds or other natural sounds just before the alarm goes off. It is ideal since it gradually rouses you from deep sleep. Your brain slowly gets rid of the sleep hormone melatonin as the light increases. By the time the alarm goes off, you are already in stage 1 or 2, which as explained before, causes less gorginess. This really works especially for people who suffer from seasonal affective disorder. 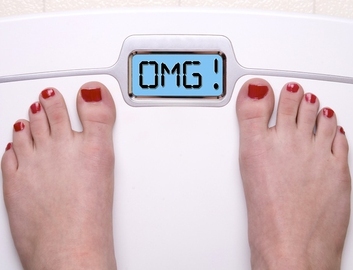 Do You Gain Weight on Your Period? Find More Here!